Computer software for geometric data in three-dimensional space (3D) are widely used in science, technology, and mathematics. 3D image helps you to view and understand spatial structures of real world using virtual world of models. You can develop and improve your technology using computer modelling with 3D features before production. Our company Image Tools Group has been developing 3D software tools for different applications since 2005. Now we start new software product for 3D printing. 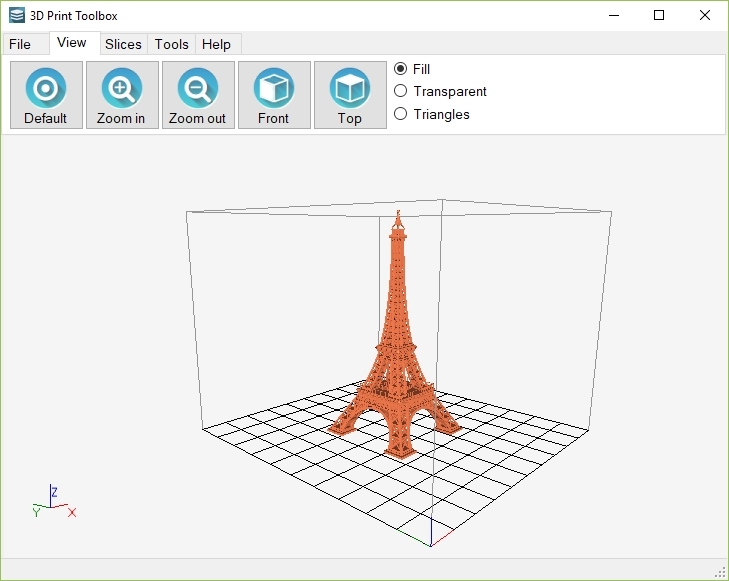 3D Print Toolbox 1.1 is a wonderful software to get you started with 3D printing. What does 3D Print Toolbox 1.1? Windows 7 or higher (32/64 bit). Requires Microsoft .NET Framework 4.6. Get 3D Print Toolbox now! You are one click away from downloading and purchasing 3D Print Toolbox 1.1. The next version of the project is under active development, so stay tuned. generates control program for printing in the format of G-code. 1. You’ll need a 3D model. The model in the format STL file is created in 3D-editors or downloaded from free sources. Our program works with a single model that is placed in the center of 3D-image area and its size should fit the printing workspace. Area size is specified in the dialog 3D Printer. 2. Operations with loaded model file. You can zoom in/out the 3D view with mouse wheel, rotate it with pressed mouse wheel. Use pressed mouse wheel and key Shift to move 3D view. Use buttons to set front and top views. 3. Graphical visualization of your model. 4. Slices your model ready for print. Start procedure for slicing into layers according to settings of 3D printer area. You can see horizontal section of model for each slice. You can make hollow model with a specified wall thickness. To see the hollow, it is necessary to switch on the checkbox Slice or use transparency and triangles views. The program does not produce G-code directly for a specific printer. You can use created G-code as a geometric template to add more processing instructions. 7. Visualization of the control program. 8. 3D print your model. Control program is loaded into a 3D printer and starts printing.